Club Penguin Cheats by Mimo777 Club Penguin Cheats by Mimo777: Club Penguin Fair and Fiery Mystery! If you have never been to The Fair, here is a bit of advice: Make sure you spend all your tickets you earn before you log off. You will loose any unspent tickets. Saweet! I love a good mystery! Sounds to me like Black Ninja Puffles! What do you think? Be sure to check back here tomorrow for all the cheats in the Penguin Style catalog, Fair Fun, and Cove mystery. 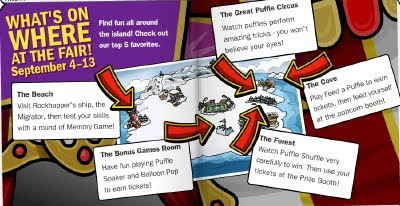 Also, I will be sure to sneak into the Great Puffle Circus so all you non-members will get a chance to see it! lol! I dont have a clue what that is supposed to mean.are they going to burn ninjas or somethin'? Maybe they will make the fire bigger for the fair and have a ninja camp or somethin'.I cant wait for the fair! Mimo?how do we sneak into the member only place?do we hack?but i donno "how" do we do that? Ya i know i read the 101 days of fun thing to and I was like um ninjas at cove? thats weird than i came here and u posted this ironic isn't it! lol! idont have a clue what thatis supposed to mean are they going to burn ninjas or somethin? maybe they will make the fire bigger for the fair and a ninja camp or somthin i cant wait for the fair! yay! that means that ninja black puffles are coming! im so excited! Hmm, fire, ninja, :O I KNOW IT! NEW NINJA STUFF RELATED TO FIRE! thanks for the advice mimo this is my first fall fair! MIMO i sent an art work up to ClubPenguin about a ninja puffle! Maybe they'll realy make one! Wow! I hope your right about the ninja puffle! That would be soooo cool! OMG! I love Mysterys! This is going to be so super awesome! I cant wait, i am so mondo excited!! I am glad I am a ninja so I can get a suprise! YES! i have a feeling that ninja puffles will be smaller than normal puffles. YES im a ninja but not a member so if their is a puffle us non members might not get it! hey mimo guess what!? now when you wana chose your difficulty for the dance contest expert is on the list now instead of click on cadence. sweet huh!? Hmm.. Lol, finally AWESOME thing on 101 days of fun... And on Friday.. 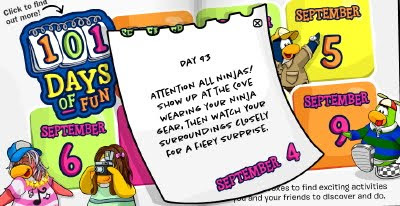 This means Ninja Surprise is MORE important than Fall Fair and Rockhopper! Cool! He doesn't hack he does something with the photo but... I'm not gonna tell you ;) It's kinda secret. o ya... us non member not get a 'secret' ninja thingy... darn it! Isn't the cove where the puffle circus is?It definetely has somtin to do with puffles.BTW I am a ninja. Thanks for the tip mimo ive never been to a fall fair before and i'm going!! Yes, Mimo777. How DO you sneak into the Special Member Rooms, huh? I hope its not hacking! And, I know about the Ninjas at the Beach with fire... its pretty obvious! I don't know, but Club Penguin will sure make it awesome! Mimo uses other member accounts, or, he's a member again. The only way for Non-Members to get into a Member-only room is by hacking, or going on another, Member, account. Maybe Mimo influenced them by being weird! Isn't that what the Ninjas are all about? No, not really. No one knows, except the Club Penguin Team. I think I saw yours! I know, right. But I would want it to be an item for your puffle to turn invisible, like Ninja Puffle Mask: 250 coins per mask. So do I. Club Penguin is so awesome! Don't be mean, 'cause if she comes in and your on her account, thats gonna be trouble. Maybe they'll just be white puffles with masks on, and instead of clouds of smoke, they have balls of fire. THAT WOULD BE MEGACOOL! They said all ninjas, so I'm guessing since not all Ninjas are Members, it will be open to everybody. Ya, but thats in the Forest, not the Cove. Mimo's membership ended around the end of July! He doesn't sneak in though. Mimo doesn't sneak in. But he never tells his secrets though! I already know! Theres an increase of black puffles over the island! They act strange around ninjas and theres going to be black ninja puffle. I bet you will see black puffles at the cove! i think it will be black puffles on fire. It is ninja puffles. Last week, if you decompiled the newspaper like Microchip123, you would find a hidden article from sensei. I demand for you to have my private party soon. The fire just blasts up randomly for a second. i think the fire is going to be bigger and u have to wear a ninja costume or something. OOO that pink penguin in the ninja picture is me!!!! just without my Christmas scarf!